As Christmas draws near, this is the perfect time to pick up a new skill to add that classic personal touch to all your festive cards and gifts! Learn the basics of modern calligraphy in this three-hour workshop – from the correct writing form to writing letters and creating flourishes. All the necessary tools will be provided in this workshop for you to start your lettering journey. As part of the package, you will also receive special Christmas themed lettering worksheets, quote exemplars, and a full-size hand-painted card to match the occasion. This workshop is also perfect for friends and couples who are looking to spend some quality time with each other, bonding over learning a new skill. Come with the heart to learn, and let us do the rest! 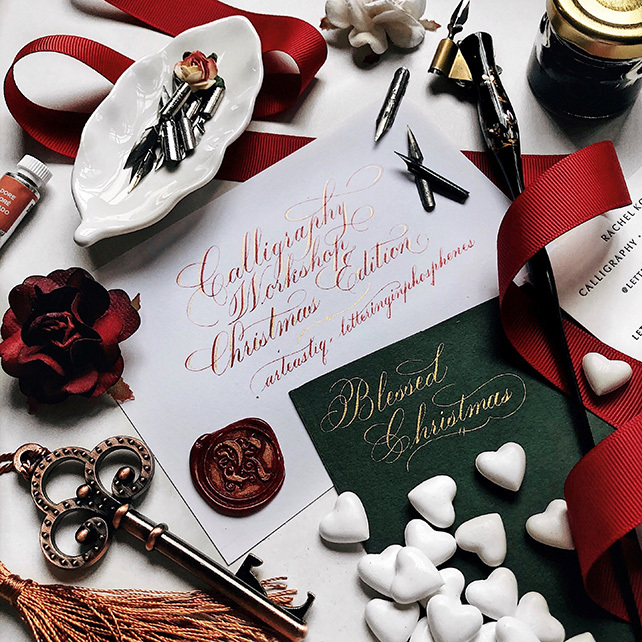 No prior experience in lettering or calligraphy is required to join in the fun as we learn all the skills to create that perfect handmade card for all those whom we are thankful for during this festive season! This class is also suitable for novice learners who have had little experience with pointed pen calligraphy, or other forms of lettering (brush calligraphy, watercolour lettering etc).